Very few in modern America, outside of those that read articles such as these, know the joy of spring birds like the eastern bluebird. It's with regret that I reference modern America, for modern America has been terminally slipping according to those citing modern America. 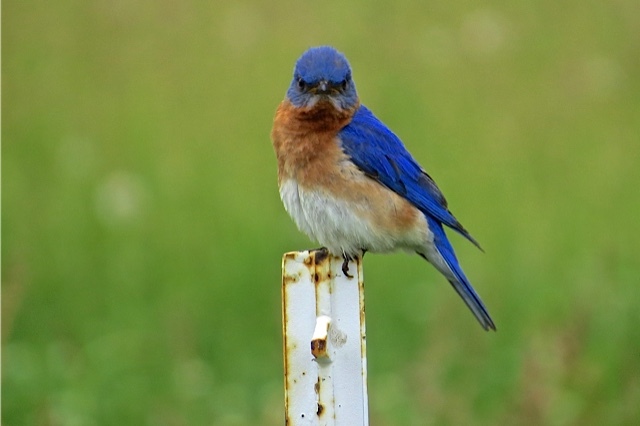 Yet, according to research by the US Fish and Wildlife Service, only 5% of Americans watch birds “away from home.” That number increases to 10% of the population when you include those who watch birds at home, but who could recognize a bluebird in their yard while failing to recognize one on a country road, at the park, or around the neighborhood? The answer is apparently 20 million people. Those people, I suspect, cannot tell a bluebird from a blue bird: an eastern bluebird from a mountain bluebird from a bluejay from an indigo bunting. I once knew spring without bluebirds. I identified spring with Easter, March Madness, baseball, and a sudden flush of green on the landscape that meant the lawn must be mowed. The calendar dictated these events, mostly. Soon I learned that spring cleaning includes not just vacuuming and window washing but also bluebird box cleaning—and spring was instantly enriched. I also learned that bluebirds are not unlike people—they hold a wide berth of opinions. Some bluebirds, first arriving on March 4 of this year, believe it is reasonable to start planning for spring well before it is fashionable to do so. A March 6 snowstorm puts into question their resultant migration, but, and I hate to say it, bluebirds have cliches just the same as people, and the early bird gets the worm. Cutworms found in lawns are a favorite food, and beetles, crickets, grasshoppers, and spiders make up a large percentage of their diet during the growing season. But those food sources are scarce on March 4, and my backyard birds rely on juniper berries, grape, sumac, and Virginia creeper to sate their hunger. Other bluebirds have arrived tardy, and on the past few mornings their soft and melodious songs have echoed me awake, only for their pastel blue wings to delight the branches of oak trees, their round bodies gracefully flapping in the gutter on the roof. These birds scope out nest boxes around my house, and that old drama unfolds as males (brightly colored blue above with rusty breasts) chase females (subtler grayish above with brownish breasts) who are waiting for males to chase away other males. Those nest boxes have increased bluebird populations across Wisconsin since declines in the 1960's and 70's, thanks largely to the Bluebird Restoration Association of Wisconsin. Today, these birds are likely to be found in urban, suburban, and rural environments where they can find a nest box or natural cavity for nesting. The relocation of a nest box last year to a position viewable from my window cued me into the ecology of bluebird life. I saw the nest, fine dried grasses and stems, with two eggs, within the average clutch size of 2-7. This pair was a second brood attempt, and I witnessed the trope of an evil villain emerge as house sparrows bombarded the parent bluebirds, a chronic occurrence in bluebird circles. As June broke into its second week, the parents' concentration seemed to break as well, and the house sparrows' repeated attacks eventually led to one of the eggs being lost. I intervened, when possible, and waved away the marauding birds. Eventually the egg hatched, and at about 14 days, right on average, the chick fledged out of the box, a welcome sigh of relief for a bluebird box I had become wholly invested in. There is drama in each of the seasons, and with the return of spring comes the drama of the liquid warble of bluebirds at Faville Grove, as sure a metaphor for spring as any. Spring is a beautiful, bounding, bountiful thing. For some, spring is, as Aldo Leopold said, “a goose cleaving the murk of March thaw.” For others spring is a sandhill crane, turkey vulture, bluebird, or swallow. Admittedly, spring is spring and I cannot pick one embodiment of a season so diverse. Rather it is with reluctance that I resort to cliches to describe the season, for, if it's possible, I find spring a refreshing and unexpected cliché—like the bright March bluebird.